This Northshore Harbour wedding was SUCH a great one. I met Claire and Nathan a few months prior for their engagement shoot and knew it would be a day full of laughs and fun! It didn’t disappoint. A beautiful heartfelt ceremony in the park, gorgeous couple shots against incredible colourful walls and a fun-filled cocktail party reception. The venue is down by the Brisbane River and they held the ceremony in the park next door with a beautiful floral arbour and family crowded all around. For the portraits we went for a very quick drive down the road from Northshore Harbour to the big, bright, colourful warehouses at Hamilton. Claire’s family came along to help shower them in confetti! I’m completely obsessed with Claire’s bouquet from Northside Flower Market and how perfectly it works against these colourful walls. The reception was a super fun and relaxed cocktail-style party with so many laughs. They had set up a DIY photo booth type couch with an amazing balloon arch and plenty of props. When it came time for the speeches, all the guests piled inside which made for such a great atmosphere. Again, so many big laughs and fabulous reactions from people so I had an absolute ball photographing this part of the day. Claire’s lovely review: “We have just received our photos and they are perfect – the whole gallery is happiness! 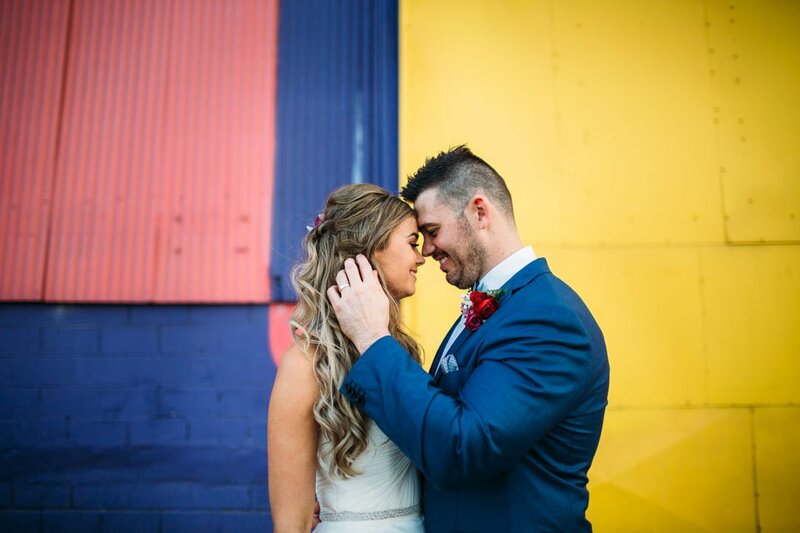 Kirsty did such an awesome job of capturing every moment – I can’t believe it was just her behind the camera! Kirsty is so talented and down to earth and we are so lucky to have had her as our wedding photographer! Now we get to relive the day and all the feels whenever we want thank you!! !